Add Beauty To Your Garden or Outdoor Event! Traditional look and dark finish adds elegance and beauty to your garden.Endless applications. Use this shepherd hook in flower beds, outdoor events, at weddings, or while camping. mason jars, holiday decorations, string lights, wind chimes, ornaments, flower balls, bird baths, and more! Unique three piece construction allows you to adjust the above ground height for 28"H or 42"H.
Maximum height is 48 inches tall minus 6 inches in the ground. 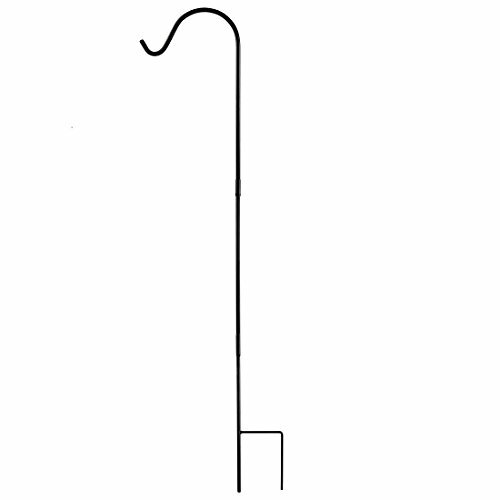 Curved shepherd hook extends about 9 inches from the pole. MULTI-PURPOSE - Use this shepherds hook for hanging planters, flower pots, bird feeders, lanterns, garden lights, mason jars, holiday decorations, string lights, wind chimes, ornaments, flower balls, bird baths, and more! ADJUSTABLE HEIGHT - Unique design allows you to adjust the above ground height for 28"H or 42"H.
PREMIUM QUALITY AND STYLE - Traditional look and dark finish adds elegance and beauty to your garden. If you have any questions about this product by Home-X, contact us by completing and submitting the form below. If you are looking for a specif part number, please include it with your message.